We are serving up toast made with products from the Zingerman’s Community of Businesses and some of our favorite flavorful ingredients. Available all day. Every day. Featuring Vollkornbrot bread, made with whole grain, organic rye – freshly milled by our friends at the Zingerman’s Bakehouse! 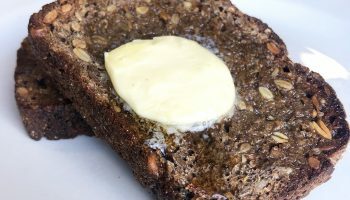 We keep it simple and top it with Kerrygold butter and Épices de Cru sea salt, so that this beyond flavorful bread can SHINE. Generous schmear of Nutella, need we say more? 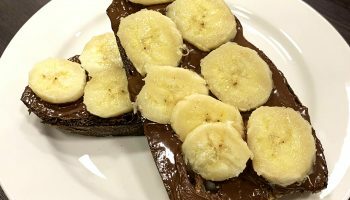 Topped with freshly sliced bananas, a sprinkle of Epices de Cru sea salt, on Zingerman’s Bakehouse Country Miche bread. A savory spread packed onto a single slice. Zingerman’s Creamery cream cheese, made with milk from Calder dairy. 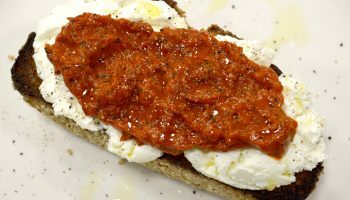 Topped with Lutenitsa, a traditional Bulgarian spread, made from roasted peppers, eggplant and tomato paste. Served on Sesame Semolina bread from the Zingerman’s Bakehouse. Slow down & warm up, y’all. 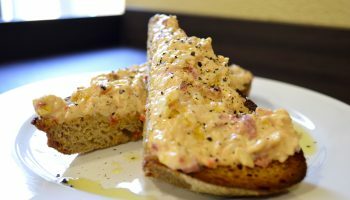 This toast features Zingerman’s Creamery pimento cheese & black pepper, lavishly spread on Roadhouse bread from Zingerman’s Bakehouse. Cool, crisp, and crunchy. Our go-to toast for those toasty days! 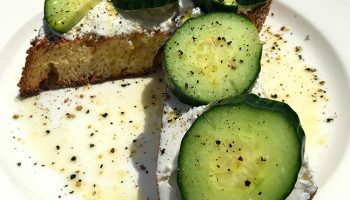 Featuring English cucumber slices and Zingerman’s Creamery cream cheese on Zingerman’s Bakehouse Sesame Semolina bread, sprinkled with salt & black pepper and drizzled with extra virgin olive oil from California Olive Ranch. The winning submission for our Totally Toasted Tournament! Business bee in the front, party pepper in the back! This toast starts off sweet, and ends with a bit ‘o heat. 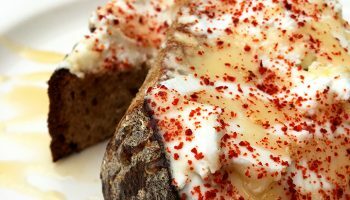 Zingerman’s Creamery goat cheese, topped with Epices de Cru Korean pepper and a drizzle of Coffee Blossom honey, on Zingerman’s Bakehouse Roadhouse bread. 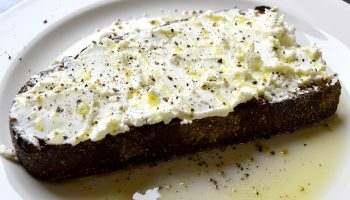 These are toppings that go together very well: Zingerman’s Creamery cream cheese made with milk from Calder dairy, ‘extra bold’ Tellicherry pepper from the mountains of Kerala, and extra virgin olive oil from California Olive Ranch. Served on Country Miche bread from the Zingerman’s Bakehouse. A classic, sweet concoction. 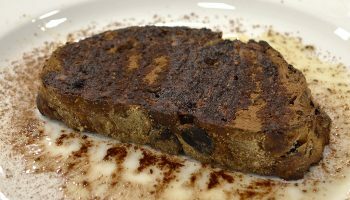 Muscovado sugar, Sri Lankan cinnamon from Epices de Cru, and Indonesian Korintje cinnamon, sprinkled on Cinnamon Raisin bread, and drizzled with extra virgin olive oil from California Olive Ranch. Delicious & nutritious! 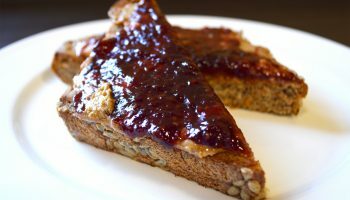 Agrimontana raspberry puree and NaturAlmond almond butter, served on Country Wheat bread from Zingerman’s Bakehouse. 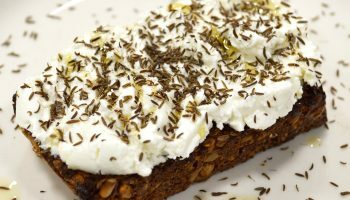 You’ll be shouting “Guten Tag!” Zingerman’s Creamery fresh goat cheese, Uzbek wild black cumin from Epices de Cru, and two stacked slices of Dinkelbrot bread, a traditional German loaf made with spelt flour, potato and sunflower seeds.